This is a resource page concerning the video of Osama bin Laden that surfaced on October 29, 2004. Several days after this page was created, the full translation of the entire 18-minute tape was released by both Al-Jazeera and MEMRI, rendering this page obsolete. It will be left online as permanent archive for those interested in this moment in history. Click here to read the transcript of the full tape published by Al-Jazeera. Click here to read the transcript of the full tape published by MEMRI. The original videotape delivered to Al-Jazeera was a full 18 minutes long. But the station created an edited-down five-minute version, which is the clip that they aired. 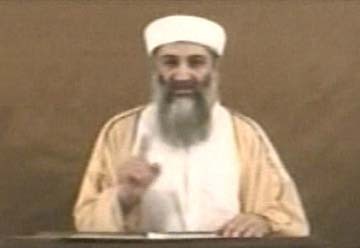 Click here to view the five-minute video of Osama bin Laden broadcast on Al-Jazeera on October 29, 2004 (Windows Media Format [.wmv], 2.3mb). Please right-click (Windows users) or control-click (Mac users) to download the video clip to your hard drive. There are three different English translations of the portion of the tape that was broadcast on Al-Jazeera. They are not identical. All three translations are given below. At the time this page was originally created, it was not yet known what was on the 13-minute portions of the tape that Al-Jazeera did not broadcast, but a glimpse at the content of the missing segments was revealed in an article published in a small newspaper in Kerala State in southern India. Click here to see the "Manorama Online" article discussing a portion of the tape that was not broadcast to the public. The text of this article is given below, after the translations. Click here to see the amazing parallels between what Osama bin Laden says on this tape and what John Kerry said in the 2004 presidential campaign. "To the American people, my talk to you is about the best way to avoid another Manhattan, about the war, its reasons and its consequences .. I tell you: Security is an important element of human life, and free people do not give up their security. Unlike what Bush says that we hate freedom, let him tell us why didn't we attack Sweden, for example. While I was looking at these destroyed towers in Lebanon, it sparked in my mind that the tyrant should be punished with the same and that we should destroy towers in America, so that it tastes what we taste and would be deterred from killing our children and women. We had agreed with the general emir Mohammed Atta, God bless his soul, to carry out all operations within 20 minutes before Bush and his administration noticed. It never occurred to us that the commander in chief of the American armed forces would leave 50,000 of his citizens in the two towers to face these horrors alone. Your security is not in the hands of Kerry, Bush or al-Qaida. Your security is in your own hands. Any state that does not mess with our security has naturally guaranteed its own security." Security is an important foundation of human life and free people do not squander their security, contrary to Bush's claims that we hate freedom. Let him tell us why we did not attack Sweden for example. It is known that those who hate freedom do not possess proud souls like those of the 19, may God rest their souls. We fought you because we are free and because we want freedom for our nation. When you squander our security we squander yours. I am surprised by you. Despite entering the fourth year after Sept. 11, Bush is still deceiving you and hiding the truth from you and therefore the reasons are still there to repeat what happened. God knows it did not cross our minds to attack the towers but after the situation became unbearable and we witnessed the injustice and tyranny of the American-Israeli alliance against our people in Palestine and Lebanon, I thought about it. And the events that affected me directly were that of 1982 and the events that followed -- when America allowed the Israelis to invade Lebanon, helped by the U.S. Sixth Fleet. In those difficult moments many emotions came over me which are hard to describe, but which produced an overwhelming feeling to reject injustice and a strong determination to punish the unjust. As I watched the destroyed towers in Lebanon, it occurred to me punish the unjust the same way (and) to destroy towers in America so it could taste some of what we are tasting and to stop killing our children and women. We had no difficulty in dealing with Bush and his administration because they resemble the regimes in our countries, half of which are ruled by the military and the other half by the sons of kings ... They have a lot of pride, arrogance, greed and thievery. We had agreed with the (the Sept. 11) overall commander Mohammed Atta, may God rest his soul, to carry out all operations in 20 minutes before Bush and his administration take notice. Your security is not in the hands of (Democratic presidential candidate John) Kerry or Bush or al Qaeda. Your security is in your own hands and each state which does not harm our security will remain safe." "You, the American people, I talk to you today about the best way to avoid another catastrophe and about war, its reasons and its consequences. And in that regard, I say to you that security is an important pillar of human life, and that free people do not compromise their security. Contrary to what [President George W.] Bush says and claims -- that we hate freedom --let him tell us then, "Why did we not attack Sweden?" It is known that those who hate freedom don't have souls with integrity, like the souls of those 19. May the mercy of God be upon them. I wonder about you. Although we are ushering the fourth year after 9/11, Bush is still exercising confusion and misleading you and not telling you the true reason. Therefore, the motivations are still there for what happened to be repeated. And I will talk to you about the reason for those events, and I will be honest with you about the moments the decision was made so that you can ponder. And I tell you, God only knows, that we never had the intentions to destroy the towers. But after the injustice was so much and we saw transgressions and the coalition between Americans and the Israelis against our people in Palestine and Lebanon, it occurred to my mind that we deal with the towers. And these special events that directly and personally affected me go back to 1982 and what happened when America gave permission for Israel to invade Lebanon. And assistance was given by the American sixth fleet. During those crucial moments, my mind was thinking about many things that are hard to describe. But they produced a feeling to refuse and reject injustice, and I had determination to punish the transgressors. And as I was looking at those towers that were destroyed in Lebanon, it occurred to me that we have to punish the transgressor with the same -- and that we had to destroy the towers in America so that they taste what we tasted, and they stop killing our women and children. We found no difficulties in dealing with the Bush administration, because of the similarities of that administration and the regimes in our countries, half of which are run by the military and half of which are run by monarchs. And our experience is vast with them. And those two kinds are full of arrogance and taking money illegally. The resemblance started when [former President George H.W.] Bush, the father, visited the area, when some of our own were impressed by America and were hoping that the visits would affect and influence our countries. Then, what happened was that he was impressed by the monarchies and the military regimes, and he was jealous of them staying in power for tens of years, embezzling the public money without any accountability. And he moved the tyranny and suppression of freedom to his own country, and they called it the Patriot Act, under the disguise of fighting terrorism. And Bush, the father, found it good to install his children as governors and leaders. We agreed with the leader of the group, Mohammed Atta, to perform all attacks within 20 minutes before [President George W.] Bush and his administration were aware of what was going on. And we never knew that the commander-in-chief of the American armed forces would leave 50,000 of his people in the two towers to face those events by themselves when they were in the most urgent need of their leader. He was more interested in listening to the child's story about the goat rather than worry about what was happening to the towers. So, we had three times the time necessary to accomplish the events. Your security is not in the hands of [Democratic presidential nominee John] Kerry or Bush or al Qaeda. Your security is in your own hands. Any nation that does not attack us will not be attacked." Doha: Al-Qaeda chief Osama bin Laden slammed US President George W. Bush's policy on Iraq, accusing him of having replaced Saddam Hussein by another "agent" in order to plunder the country's oil resources, Al-Jazeera TV has reported. According to Al-Jazeera, which did not broadcast the excerpt on Iraq, bin Laden accused Bush of having replaced one US agent by another at the head of the Iraqi regime so that he helps the United States plunder Iraqi oil resources. Al-Jazeera said bin Laden also accused the United States of considering injustice and the massacre of innocent people to be a legitimate act and said that the September 11, 2001 attacks on New York and Washington were a response to US injustices."